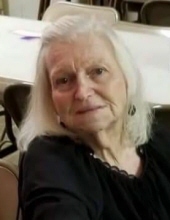 Mrs. Mary Pauline Smith, age 81, of Rockmart, passed away Tuesday, January 15, 2019 in a Rome medical center. She was born in Rome, GA on June 30, 1937, a daughter of the late Benjamin Keifer Touchstone and the late Thelma Wimpey Touchstone. Mrs. Smith lived the greater part of her life in Rome before moving to Rockmart where she made her home for the past twenty years. She was a member of the New Zion Baptist Church of Rome and had been attending Van Wert Baptist Church in Rockmart. Mrs. Smith had a passion for gardening; loved to sew and was an animal lover. She had a great love for her family, children, grandchildren and friends. In addition to her parents she was preceded in death by a brother, J.B. Touchstone; two sisters: Kathleen Pruitt and Neva Hulsey; and a great granddaughter, Summer Fricks. She is survived by her five children: Karen Elaine Nix (Ronnie), Rome, Eddy Smith (Rita), Rome, Mary McCollum (Tim), Armuchee, Susan Venita Cabe, Villa Rica and Michelle Cochran (Joey), Rockmart; fourteen grandchildren: Jessica, Dusty, Cindy, Tommy, Brianne, Chris, Mitch, Bryan, Jacob, Alicia, Brittany, Zac, Ivy and Jazz; four great grandchildren: Hunter, Rylee, Stella and Thea; two sisters: Glenda Jacobs and Sue Matthews; two brothers: James Touchstone and Kenneth Touchstone; numerous nieces, nephews and fiends also survive. Memorial services will be held Saturday, January 19, 2019 at 2:00 pm in the chapel of the Alvis Miller & Son Funeral Home with Rev. Danny Dunn officiating and eulogies given by family members. The family will receive friends Saturday afternoon from 1:00 pm until the memorial hour at the funeral home. The Alvis Miller & Son Funeral Home is in charge of arrangements for Mrs. Mary Pauline Smith. To send flowers or a remembrance gift to the family of Mary Pauline Smith, please visit our Tribute Store. "Email Address" would like to share the life celebration of Mary Pauline Smith. Click on the "link" to go to share a favorite memory or leave a condolence message for the family.